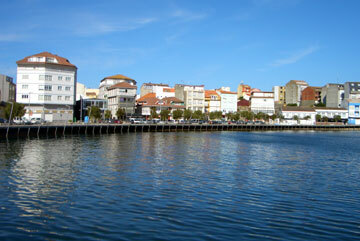 Camarinas is a beautiful little port town in the north of the la Coruna province and if you are doing some coastal exploration in this part of Galicia it is a place well worth seeing. The main and most striking feature of Camarinas is its almost semi-circular bay with a small Marina at one end. This bay has a timber boardwalk running around its perimeter and the metal safety railings to the sea edge are set at an angle rather than being vertical. All told it manages to be both traditional and modern and, as you approach the town from the south and above, it is very picturesque. 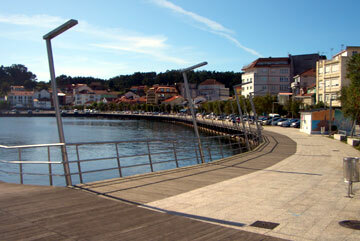 If you cross the road that mirrors the bay you will find a number of café bars and restaurants. We have eaten at a couple of these and both were good. What you will also see is a number of shops selling highly decorative needlework items ranging from net curtains and purses, to wine bottle covers. This town is renowned for this kind of decorative stitching and the complexity of some of the items on sale is amazing. As a general guide, the larger the item the more expensive it will be, but there are many smaller keep-sake pieces that are affordable if you want something to remind you of Camarinas. At numerous spots around the bay there were lobster and crab pots pilled up. Equally, the majority of the boats in the small Marina were fishing vessels of some description, so the sea still plays a role in the economy of the town. There may be a fish market (and indeed a general market) behind the sea facing buildings, but we did not venture back that far. On each occasion that we have visited Camarinas it has been on a clear sunny day, but the town has still been fairly quiet. I suspect that for many it is a little bit too far from Santiago de Compostela or la Coruna, or that it is not as well known as some of the other (often less attractive) coastal towns in the province. For my part, I think that Camarinas can easily be scheduled into a day trip travelling around this more northerly part of the la Coruna coastline and, if you are based in e.g. Santiago de Compostela, there are a number of routes that cut across the rias and make getting to this part of the coast a relatively quick trek. Finally, just to offer some further incentives for visiting Camarinas, you can combine it with other towns like the equally appealing Muxia and there is a very impressive lighthouse (Faro Cabo Vilán) just a few kilometres away with a visitor center and some stunning views of the Galician coastline - see lighthouse near Camarinas. There is even a scale model of this lighthouse in one of the shop windows in Camarinas. As ever, you will also pass through a number of small villages that never appear in guides and that people like us try to keep to ourselves. The photos on this page are, from the top down - Looking across the bay promenade from the start of the boardwalk. Looking back towards the town from the far side of the Marina. 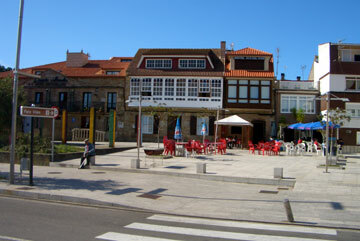 A courtyard in the town. 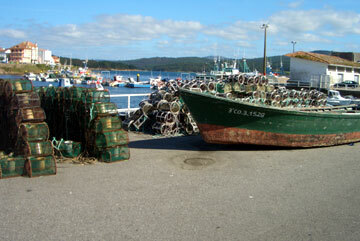 Lobster pots by the side of the port.